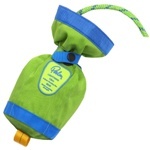 Throwlines are an essential item of river safety equipment. Marine grade stainless steel ring. Unique ring design throwline with full length webbing reinforcing. Made from tough 600d polyester ripstop and nylon shell. Quick draining and drying slotted base. 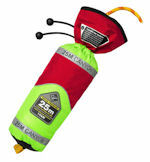 Contains a 9.5mm floating polypropylene rope. Easy and tidy cam buckle open / closure system. Comfortable handle for packing and throwing. Webbing loops to compliment a Guide Belt. Extra small, light weight, highly functional and good-value-for money. Specifications and labelling area printed on base. 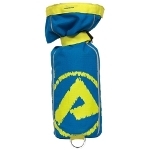 Cone shaped bag with extra wide opening, for accurate throws and easy repacking.